Disney Interactive Studio gives you the opportunity to play an interactive game with your favorite Disney characters like Stitch, Winnie the Pooh, Dory and Simba on the Nintendo DS. You get to be the guardians for these Disney characters, you have to befriend them by taking care of their needs and feeding them and also not letting them get bored. Now not letting them get bored is a difficult task and to not let that happen to have to engage them in activities like painting. 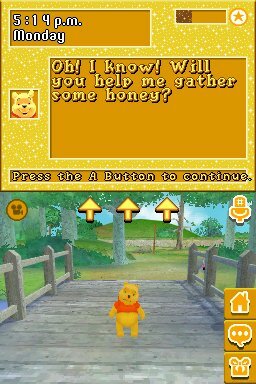 There are also various mini-games for each character, Winnie’s mini-game requires you to fill up honey jars and feed him. There are different stages in which you befriend a character and affection comes across as being the most time consuming of all of them. You have a touch screen and microphone enhancement which makes the process of becoming friend a tad easier. There are stages when you come upfront with your friends and you have to help them solve their worries. For example when you are playing with Piglet, he could suddenly be scared and could be hiding in the corner as a result of the strong winds which have blown open all windows, you have to make him feel clam and safe by closing the windows and putting on the lights again. If you are an avid Disney fan and adore the likes of Pooh and Simba then you will enjoy playing Disney Friends. Disney has called this a ‘Virtual Interactive Simulator’. Now you have the chance to become friends with all these lovely Disney characters and also care for them.